In this article, I’ll explain why castor oil is indicated as an effective hair loss treatment method, and how you can use castor oil for hair growth yourself. You’re going to learn about ricinoleic acid, an omega-9 fatty acid which makes up the majority of castor oil’s composition. Further, you’ll discover how scientific research has indicated its possible use as an inhibitor of PGD2, a compound found to be present in overabundance within the scalps of men with androgenetic alopecia. Then, I’ll teach you the exact best way to apply castor oil to your scalp for maximum benefits. Finally, I would recommend taking my new 6 part questionnaire to calculate your chances of naturally re-growing your hair. The higher your score the more likely that castor oil and other natural methods will successfully work for you. 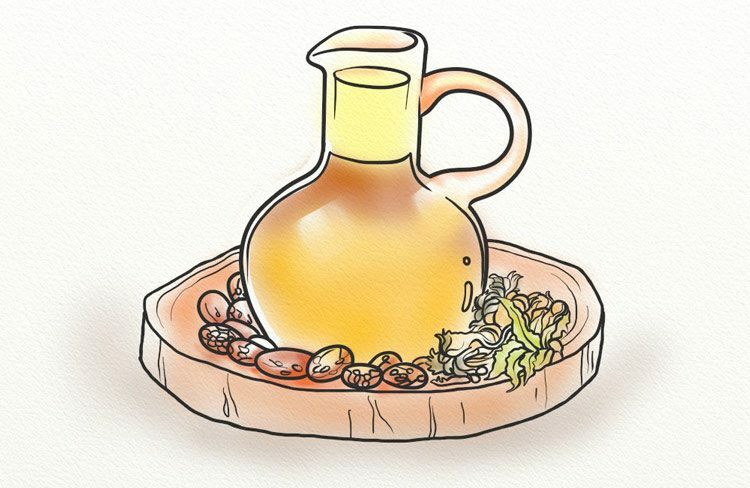 A vegetable oil obtained through the pressing of the seeds of the castor oil plant, castor oil is used in a variety of industries and is known for its mold-inhibiting and lubricating abilities. Now found in tropic regions throughout the world, the castor oil plant is native to the Mediterranean Basin, Eastern Africa, and India. The flowers of this glossy-leaved plant range in color from yellowish-green to red, and its size can vary tremendously. Not-so-fun fact: Consumption of castor beans can be fatal (1). This is due to the levels of ricin found within the bean. Castor oil, however, does not contain ricin, as the process of oil extraction heats up the protein to such an extent as to denature and inactivate it. What really makes this plant so special, however, is the abundance of ricinoleic acid which is present within its oil. Ricinoleic acid makes up 89.5% of castor oil’s fatty acid composition and has various properties which lend themselves to effective treatment of hair loss (2). Can Castor Oil Be Used to Treat Hair Loss? When it comes to answering this question, I like to look at the cold, hard facts. 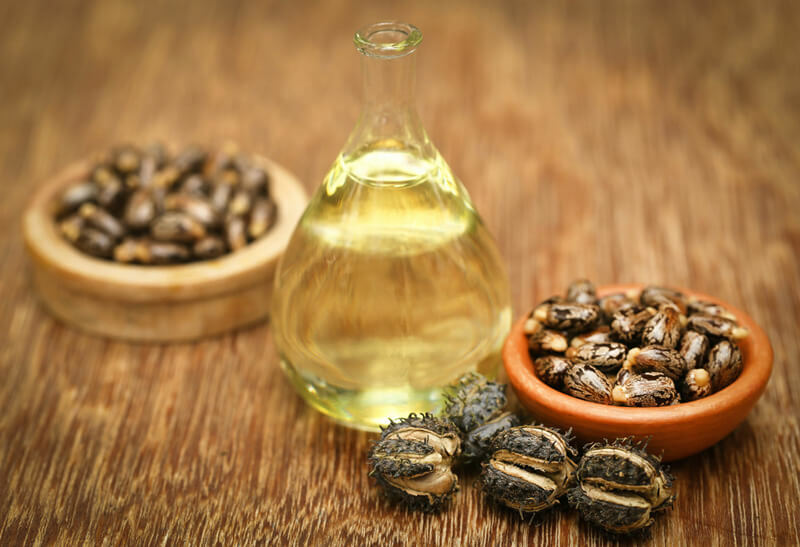 Castor oil contains high amounts of ricinoleic acid, an omega-9 fatty acid which has been shown to have anti-inflammatory, antimicrobial, and antioxidant properties (3, 4, 5). These properties alone make ricinoleic acid and, therefore, castor oil, a treatment option to be considered by those with alopecia. Inflammation of the scalp constricts blood flow to the hair follicle, reducing the levels of necessary nutrients. Additionally, inflammation can be a direct cause of hair loss, especially for those with scarring alopecia (6). Ricinoleic acid, however, has been shown to have anti-inflammatory effects, similar to capsaicin, but without an increase of blood flow to the applied area, which can cause irritation (7). Further, ricinoleic acid’s antimicrobial abilities may provide relief to hair loss sufferers who are struggling with bacterial or fungal infections of the scalp. Application of castor oil can treat the infection and ensure that your scalp and hair follicles stay clean, healthy, and free from infection. And, as if inflammation and infection weren’t enough, free radicals are another contributor to hair thinning and loss. Ricinoleic acid’s free radical scavenging abilities, however, can help you to reduce the levels of cell damage within your scalp. What Does the Research Have to Say? While human studies on the use of castor oil in the treatment of alopecia are lacking, there are a few studies which compel me to believe that castor oil is a viable option for hair loss treatment. 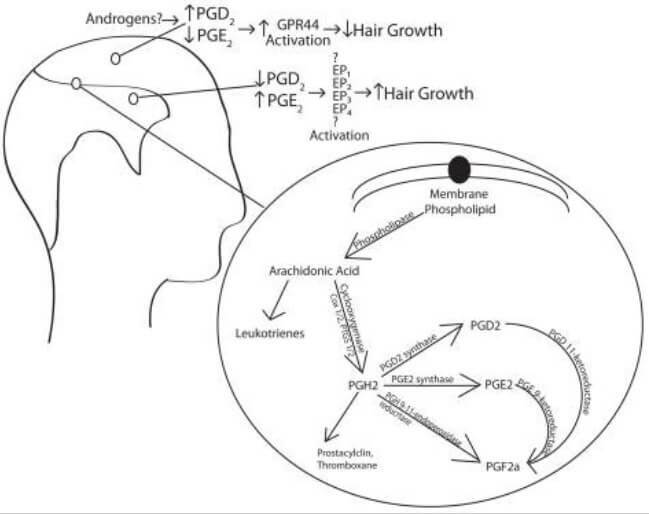 A 2012 study conducted by Garza et al discovered a link between PGD2 elevation and hair loss, first in mice and then in men (8). Initially, Garza and his team tested their theory on mice. 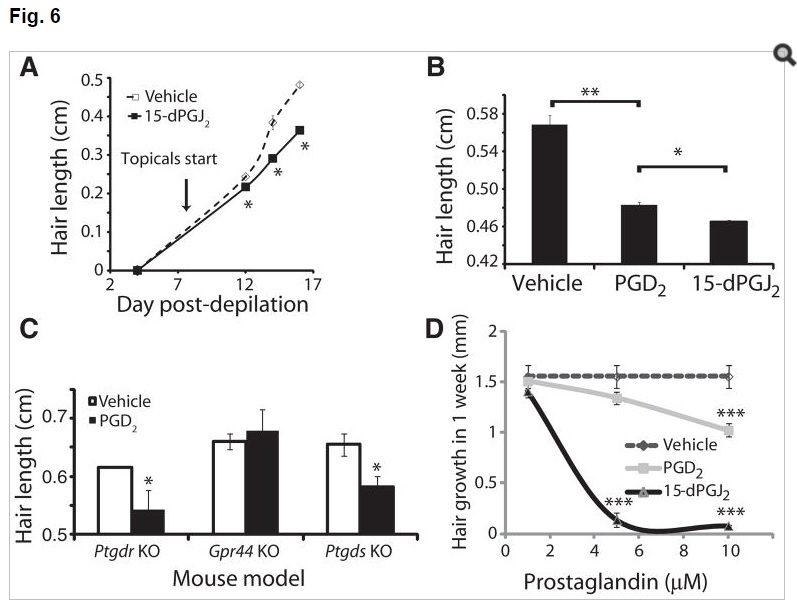 Two groups of mice were used, both of which received an initial topical application of 15-dPGJ2 in order to synchronize the hair follicle cycles of all mice. On day 8, however, only one group received another application of the 15-dPGJ2 while the control group received an acetone vehicle. The hair lengths of the mice were measured on days 4, 12, 14, and 16, and as is clear in the tables below, the mice which received the additional 15-dPGJ2 treatment had shorter hair lengths than those mice in the control group. Source. PGD2 levels of mice in the control group and mice who received an application of15-dPGJ2 (A-C). The effects of PGD2 and 15-dPGJ2 on human hair growth (D). Additionally, researchers looked at the effects of PGD2 and 15-dPGJ2 on human hair follicles. Extracted follicles were maintained in culture for 7 days, where increasing amounts of vehicle, PGD2, or 15-dPGJ2 were applied. The results of this particular test can be seen in figure 6D above. Through this study, researchers formed the theory that the GPR44 receptor is to blame for PGD>sub>2 and 15-dPGJ2’s inhibitory activities. Researchers were also interested in the levels of PGD2 present in men with androgenetic alopecia (AGA) and those without. Source. The levels of PGD2 and 15-dPGJ2 in haired men vs. bald men. Through the use of mass spectrometry, the researchers were able to determine the levels of PGD2 within the studied men. In the balding men, the levels were 16.3 ng/g tissue, while in men with hair, the levels were 1.5 ng/g. Source. A simplified version of the arachidonic acid cascade showing how the enzyme, prostaglandin D synthase (PTGDS), converts PGH2 to PGD2. scenario. In other words, does an over-production of PGD2 lead to hair loss, or does hair loss, in some way, trigger the overproduction? PGD2 is actually an important player in the development of the male reproductive system (9). PGD2 production is fueled by testosterone through a process known as the arachidonic acid cascade (10). Unfortunately, this process can sometimes lead to the overproduction of PGD2, known to slow hair growth, while simultaneously under-producing PGE2, a prostaglandin which is actually linked to hair growth induction (11, 12). This imbalance leads to the triggering of Gpr44, the receptor mentioned above which is believed to be responsible for PGD2’s ill effects. This entire process, ultimately, results in one thing: slowed hair growth. If the overproduction of PGD2 plays a role in hair loss, then what can be done to prevent its unwanted effects? While clinical trials are underway to test the effectiveness of various pharmaceutical drugs on their abilities to reduce the effect of PGD2 by blocking the GPR44 receptor, a recent study by researchers in China shows that castor oil may provide a natural and readily-available alternative (13). Fong et al selected 12 herbs commonly used in Traditional Chinese Medicine and tested various aspects of each. The aim of the study was to determine whether any of the 12 herbs or their constitutents were inhibitors of prostaglandin D2 synthase (PTDGS) and, therefore, could be developed for use in the treatment of androgenetic alopecia (male-pattern baldness). One of the herbs which was tested was, you guessed it, castor. Or, ‘ricinus communis’ as it was identified in the study. As discovered by researchers, ricinoleic acid, a major component of castor, has a few properties which made it stand out as a potentially effective inhibitor of PDG2. First and foremost, ricinoleic acid received a high docking score as tested by researchers. Docking is an indicator of inhibitory prowess, as it shows an ability to interact and bind. In fact, the similarity in chemical structures between ricinoleic acid and prostaglandin is a good indicator of its ability to interact and bind with the molecule. The striking similarities can be seen by comparing the below prostaglandin structures with the above image of ricinoleic acid. Source. The chemical structures of three prostaglandins: PGE2, PGF2, and PGD2. Second, ricinoleic acid has excellent skin permeability. This is important for the exertion of its pharmacological effects. Third, ricinoleic acid has minimal adverse effects when applied topically. With this information in hand, researchers concluded that ricinoleic acid, along with four other TCM constituents, show potentially strong inhibitory properties as it relates to PGD2, though further research is required. While the consumption of castor oil can have undesirable effects, direct application to the scalp can prove to be an effective way to boost hair growth and improve the overall quality of your scalp and hair. One shampoo that I go back to again and again is my maple syrup and carrot seed recipe. The combination of ingredients is excellent for individuals looking to fight hair loss and reap the benefits of a healthy scalp. Mix the ingredients thoroughly. 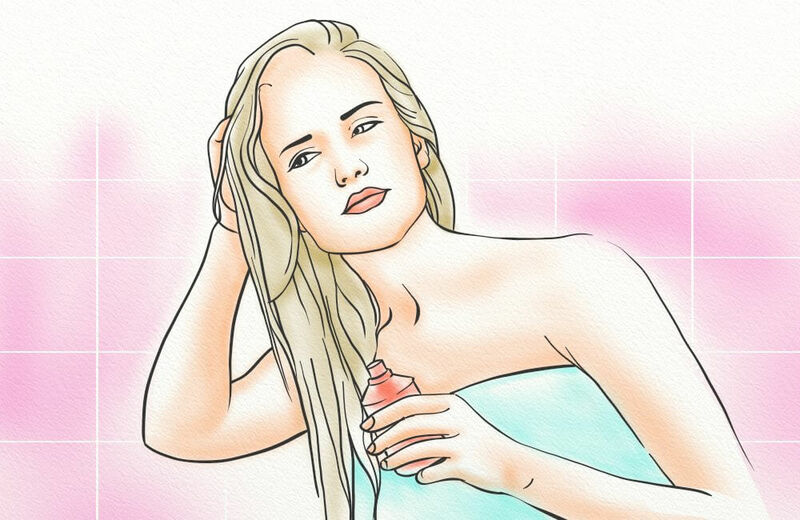 Apply evenly to your wet scalp, working the mixture in with your fingertips for 2-3 minutes. The soothing effects of the maple syrup, combined with the scalp-stimulating and antifungal properties of the carrot seed oil, make this shampoo an essential addition to your hair care rotation. Beginning with a palm-sized amount, work the castor oil through your hair from root to tip. Continue adding small amounts of castor oil until your hair and scalp are covered, but not saturated. You can leave the castor oil in overnight, or rinse thoroughly 20-30 minutes after application. Tip: As castor oil is thicker than other oils you may have applied previously, like olive oil or canola oil, you will want to apply in small, incremental amounts to avoid over-application. This will make rinsing of the oil easier. Additionally, you can combine castor oil with other oils, such as grapeseed, to reduce the viscosity and make it easier to apply and spread throughout your hair. Are There Side Effects Associated with Castor Oil Supplementation? Castor oil, when consumed, is known to have laxative effects (14). An over-consumption of castor oil can lead to intestinal cramping and nutrient malabsorption, and should be avoided. An allergic reaction, while rare, can occur upon application of castor oil to the skin. Prior to use on your scalp, it’s recommended that you first test on a small area of skin. If you experience itchy, hives, rash, redness, or hotness, avoid further application. While castor oil’s effects on labor induction are still debated, the consumption of castor oil by pregnant woman has been shown to induce nausea (15). Women who are pregnant should consult with their medical professional prior to use. The studies have shown that, while the overproduction of PDG2 is linked to slowed hair growth and eventual hair loss, ricinoleic acid, the main component of castor oil, is indicated as a possible inhibitor of the compound (8, 13). 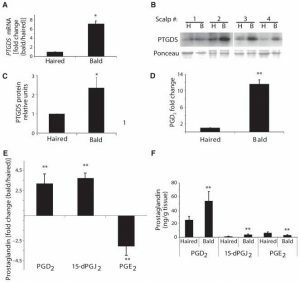 While further testing is required to determine ricinoleic acid’s PDG2-inhibiting abilities in vivo, there is no doubt as to the fatty acid’s anti-inflammatory, antimicrobial, and antioxidant abilities (3, 4, 5). This alone makes castor oil a treatment option for individuals looking to fight hair fall. If you’re looking to find treatment for aggressive hair loss, however, then castor oil is not it. Its listed properties may be beneficial in terms of scalp health and cleansing, but there are no indications that castor oil can totally reverse hair loss. Instead, castor oil used frequently can help to prevent further hair loss and create a hygienic environment in which hair can grow. What is the best oil for regrowing hair? Peppermint essential oil (+ a carrier oil) has performed the best in clinical studies. I’d like to make a shampoo consisting of castor oil, peppermint castile soap, Thuja Orientalis hot water extract and caffeine. Hi Jack, that could work, but I wouldn’t use too much castor oil otherwise it would leave your hair feeling greasy. I do also prefer to use apple cider vinegar to castile soap. Thanks Will. I use a 1:1 ratio of ACV and water after I shampoo. I don’t wash it out. I concur with you on not using too much of the castor oil as it is very viscous. Can I make a mixture of (peppermint oil + rosemary oil + pumpkin seed oil) with olive oil as carrier oil ? If yes, what should be the proportions of the same ? And can I apply it after I’ve applied the derma roller ? Hi Dre, I wouldn’t use olive oil as the carrier oil, it’s just too messy and can clog the follicles. A general rule of thumb is to use 5% or less essential oils to carrier oils. No, don’t apply it right after using the dermaroller because this will sting a lot due to the essential oils. Wait at least 12 hours between the two. That seems reasonable, but I’ve found it not to be the case. 48% grapeseed oil, 48% organic, cold pressed pumpkin seed oil, 15 drops of peppermint, rosemary, cedarwood & lavender essential oils to my entire scalp, which, far from stinging the skin, give a pleasant cooling sensation. Which carrier oil is used with mint oil? This is entirely up to you. There are plenty of carrier oils to choose from (including castor, almond, jojoba, coconut). As for proportions, Will recommends 5mL of carrier oil for each drop of essential oil. Will I’ve been applying a thin layer of castor oil to my scalp 3-4 times per week for 2 months now. I’d like to add peppermint oil and possibly rosemary and/or tea tree oil as well. Since they are essential oils, I know that they ought to constitute a small portion of the overall mixture. What is the proper ratio of castor to peppermint/rosemary/tea tree? Also what do you think about using a small dermastamp prior to applying the oil mixture in order to improve absorption into the scalp? Will recommends 5mL of carrier oil for every drop of essential oil. As for the dermastamp, it’d be best to not apply them together. The essential oils can irritate the scalp. However, you can apply them about 8 hours after the dermastamp session.